The Japanese government honored on November 3, 2015, 3,964 of the country’s most distinguished citizens while also conferring orders on a record 89 foreigners from 38 nations, including retired American Major League Baseball player Hank Aaron, 81, who received the Order of the Rising Sun, Gold Rays with Rosette. Considered as one of the best baseball players of all time, he set a MLB record with 755 career home runs. 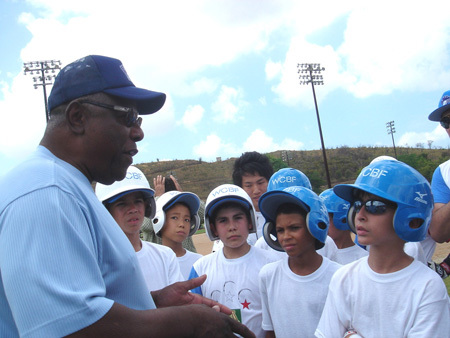 The Japanese award was given in recognition of his contribution to promote international friendship among children through baseball as well as developing goodwill between U.S. and Japan over the years. He is the co-founder of World Children’s Baseball Fair (WCBF) with Sadaharu Oh (75), Chairman of WCBF and former Tokyo Yomiuri Giants great who slugged 868 career home runs. The WCBF inaugural event was held in Los Angeles in 1990, and nearly 5200 participants - boys and girls of 10 and 11 years old from 93 countries/regions, have attended this global event with the latest one (25th ) held in August, 2015 in Chiba, Japan where both Sadaharu Oh and Hank Aaron joined at the opening ceremony. The awards ceremony will be held on November 5 at the Imperial Palace, with Emperor Akihito and Prime Minister Shinzo Abe in attendance.